How To Install UP-828P High Speed Universal Programmer Software? UP-828P High Speed Universal Programmer is an important programmer in chips reading/writing industry. it works with nearly one hundred kinds of UP-828P UP818P adapters for your choice. it special for mobile device memory chips. This article is intended to help those friends who bought up-828p programmer but don't know how to install the software. How do you have similar problems? Please to read it carefully. 1. Download software from official website, double-click UP828PSetup.exe to install. Note: if the .net framework is not installed on your computer, you have to first install .net software to work properly. 2. Select the installation directory: Generally, you can install it by default path. 1. Connect the UP-828P programmer with PC, turn on the pwoer swith, the PC will automatically search for the usb driver. 1. Open the device manager of the computer (can also be opened in the software tool options), refresh it, and an “unknown device” with a yellow exclamation mark will appear. 2. Select the unknown device and right-click to select "Update or Uninstall Driver". 3. Point to the folder where the driver is located (drive in the Install folder or Drivers folder in the installation folder. Name is X64 X 86) UP-xxxx -> Install -> x64 or x86. 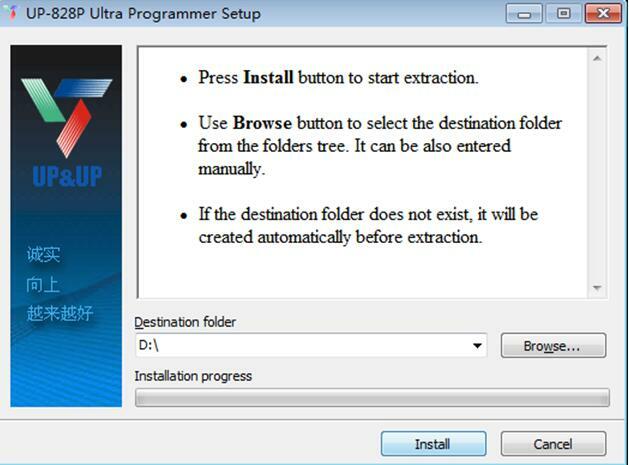 Press Next, the system will automatically Found the driver and the installated successfully. 1. Select "Select from a list of device drivers for your computer." Press Next. 2. Select "Install from disk" and press Next.